On paintings of the cross there is a sign with the letters ‘INRI’. What does that mean? INRI is a short word for ‘Iesus Nazarenus, Rex Iudaeorum’. It’s Latin. Translated INRI means: ‘Jesus the Nazarene, King of the Jews’. The Roman governor Pilate wrote these words in Latin, Greek and Hebrew on a wooden sign and mailed it on the cross as a message for all who where passing by (See John 19 :19). INRI is the ‘title’ Pilate gives to Jesus, as reason why He was convicted and crucified. Jesus accusators, the spiritual leaders, said to Pilate that Jesus claimed to be the king of the Jews. In the gospel you can read that Jesus speaks very often about the kingdom of God as His kingdom. Jesus unifies Himself with God, implicating He is the Son of Man, the Messiah. The leaders hate Him for that. During Jesus’ trail, Pilate asks Him if He indeed is the ‘king of the Jews’. Jesus answers: “You say it” and tells him: “My Kingdom is not of this world. If My Kingdom were of this world, then My servants would have fought, so that I would not be delivered to the Jews; but now My Kingdom is not from here” (John 18: 36). He is indeed the king of the Jews and all the nations on earth. But, Jesus came not to rule but to serve mankind through His live and death. He “Humbled himself by becoming obedient” to God His Father “to the point of death, even death on a cross. Therefore God has highly exalted him and bestowed on him the name that is above every name” (Phillipians 2: 8, 9). It was Gods eternal plan that His Son would drink this cup of suffering to make believers “holy and blameless” for Him (Ephesians 1: 4). Pilate wrote “Jesus the Nazarene” because most people knew Him by that name. Jesus had lived in Nazareth for a long time. This place was not popular in Israel. It was situated in the region of Galilee, which was called ‘Galilee of the Gentiles’. When Nathanael, a disciple of Jesus, heard of Jesus for the first time, he says: “Can anything good come out of Nazareth?” (John 1: 46). There are no Bible prophecies about Nazareth. That’s why the friends of Nicodemus (who believe in Jesus) say: “Look for yourself whether a prophet comes from Galilee“. But they forgot that Jesus the ‘king of the Jews’ (Matthew 2: 2) was born in Bethlehem. That’s the place where, according to Micah 5: 2, the Messiah would be born. The Bible does not explicitly mentions the motivation why Pilate wrote INRI on the sign. It is likely that he wanted to make clear how he felt about the case of Jesus. He found Him innocent, and for several times he tried to free him from a death verdict. Pilate said to the leaders: “Take him yourselves and crucify him, for I find no guilt in him“, and: “Behold your King!” (John 19: 6, 14). The leaders don’t accept His sympathy for Jesus. They warn Pilate that they would call him an enemy of the Roman emperor if he would not convict Jesus. That was a big threat to him as a governor. If the ceasar in Rome would hear that, he could lose his career and luxureous possessions. So, he chooses to condemn Jesus. But Pilate got a chance to take revenge on the accusators. He writes on the wooden sign that Jesus hangs on the cross because He is ‘the king of the Jews’. Not surprisingly, they are not happy with that text. They ask him: “Do not write, ‘The King of the Jews,’ but rather, ‘This man said, I am King of the Jews.” Pilate answered, “What I have written I have written.” (John 19: 21, 22). Gods hand is in the revengeful writing of Pilate. The Lord turns it in a message of hope and salvation through Jesus. In a spiritual sense, the verdict of Pilate was the verdict of God on your sins. 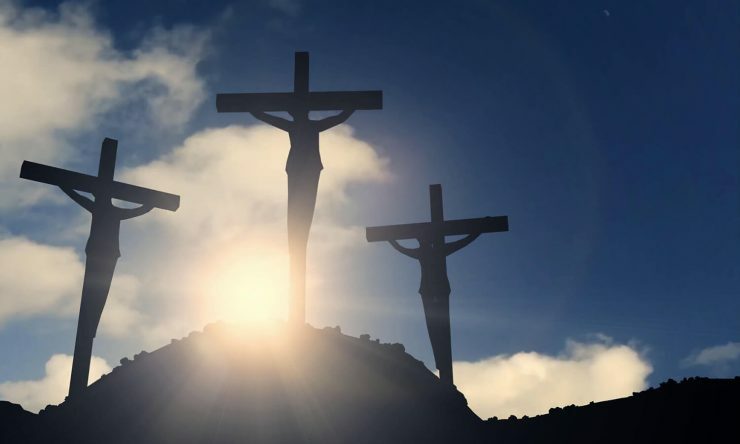 The king of the Jews “was pierced for our transgressions; he was crushed for our iniquities; upon him was the chastisement that brought us peace, and with his wounds we are healed” (Isaiah 53: 5, 6). At the end of this explanation I want to share with you a fragment of a beautiful poem a christian poet wrote about the cross of Jesus. Also read Why did Jesus have to die? Pieter Brands (1980) grew up in a Christian family in the small village of Urk, the Netherlands. He came to faith in his high school years. He studied Theology at the Evangelical Theological University in Veenendaal and at the Theological University of Apeldoorn. In his church, Pieter has been an elder for five years now. He also volunteers in evangelisation and Christian youth work. As his daily work, Brands runs his own fundraising and consultancy firm. Why is Jesus interceding for us? What does it mean that Jesus died for me?